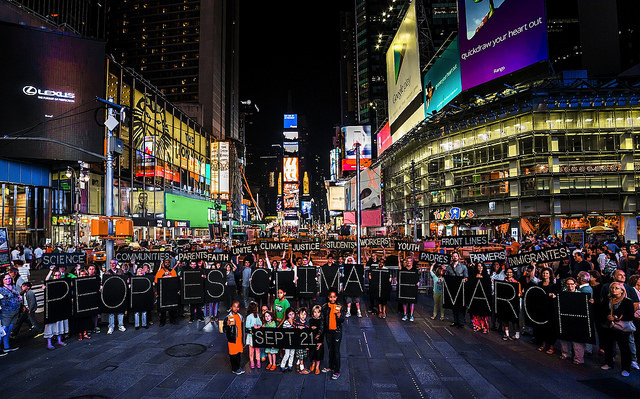 On September 21st, thousands of rallies, marches and protests will take place delivering the biggest ever global demonstration for climate action in history. The largest will be in New York where upwards of 100,000 people are expected to come together to demand leaders take action in advance of the Ban Ki Moon climate summit that takes place two days later. “There’s a vast latent constituency of people out there who are alarmed about climate change. But for years, nobody has put up a banner that said ‘this is the time, this is the place, to show you care.’ The People’s Climate March is that banner, and we’re seeing a phenomenal response to it,” said Ricken Patel, Executive Director of the 38-million member civic organization, Avaaz. More than 2,000 “People’s Climate” events are planned worldwide in 150 countries. Over 30 celebrities have also begun showing support for the march, including UN Goodwill Ambassador for Biodiversity and actor Edward Norton, His Serene Highness Prince Albert II of Monaco, as well Argentine footballer Lionel Messi. The worldwide mobilization and march in New York City will take place just two days before world leaders are set to attend a Climate Summit at the United Nations hosted by Secretary General Ban Ki-moon. The summit is designed to build momentum for national and international climate action, including a new global climate treaty that will be finalized in Paris next year. Mobilization organizers say they are looking for “Action, Not Words” at the summit. If the EU is not prepared to defend its rights values at home, how can it credibly do so abroad?